 The nominee for assistant attorney general for civil rights who was dumped by President Clinton in the face of right-wing pressure offers the academic writings that were distorted into soundbites and led to her being labeled a ``quota queen'' by the Wall Street Journal and others. Guinier (Law/Univ. of Pennsylvania) proclaims herself a ``democratic idealist,'' and in her introductory chapter she claims credibly that her ideas are not out of the mainstream. Unfortunately, as Yale law professor Stephen Carter (The Culture of Disbelief, 1993) states in a savvy preface, the withdrawal of Guinier's nomination deprived us of a chance at a ``national seminar'' on race and politics. 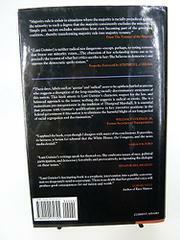 Guinier's footnote-laden essays, aimed at academics, are heavy going, but her points are challenging. The Voting Rights Act, she argues, has been more successful in achieving the election of black officials than in altering the conditions of their constituents. She cogently suggests that winner-take-all voting systems that consistently exclude minorities are undemocratic. But she argues against remedy by gerrymandering, calling attention, in an example, to the status of blacks and Asians in New York City's new, geographically distorted ``Latino'' congressional district. Instead, she advocates cumulative voting, which is used in corporate elections. Thus, in at-large races for several seats, a minority voter can wield influence by clustering his or her several ballots for a preferred candidate. Yes, Guinier's view of the ideological homogeneity of African-Americans calls for debate, but her much-lambasted critique of who is an ``authentic'' black leader is actually fairly subtle, if murkily expressed. More an artifact than a full exposition of the issues involved, but a primary source response to a craven episode in nomination history. "LET US RAISE A STANDARD..."